Tourmaster Choral Risers ~ A Customer Service Rep will contact you with a shipping quote. Shipping to Continental USA Only. The light-weight, easy-to-set-up riser that's perfect for travel. No other risers fold, roll, set up, or travel so smoothly. In fact, it's easy to take it around tight corners, across the parking lot, into a bus or a van. No wonder it's the #1 choral riser in the world. Precision engineering and using only the best materials means Tourmaster risers will deliver reliable operation for a long, long time. It ensures that Tourmaster Choral Risers are definitely your best traveling riser value. 3-step models in 4' (1.2 m), 4' 7" (1.4 m) and 6' (1.8 m) lengths. Empty: 66" long x 30-1/4" wide x 77-3/4" high (1676 x 768 x 1975 mm), 166 lb (75 kg). With 3-step risers and back rail: 84" long x 30-1/4" wide x 77-3/4" high (2134 x 768 x 1975 mm), 800 lb (363 kg). With 3-step risers, back rail, and 4th step additions: 106" long x 30-1/4" wide x 77-3/4" high (2692 x 768 x 1975 mm), 1012 lb (459 kg). 6" (152 mm) diameter casters, all four casters swivel. Cart is steel construction with black baked on powder paint. Lift and rotate swing arms out of the way to allow risers to be easily loaded and unloaded. Fits through a standard 36" (914 mm) doorway. 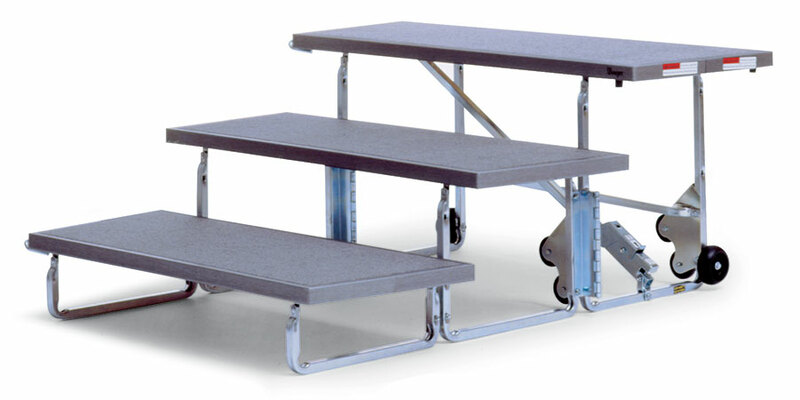 Cart is designed to carry four risers, four rails (back, side or a combination) and four optional 4th-steps. Wenger Corporation offers a 15 year warranty on this product. See www.wengercorp.com for more details.